In 1922, brothers Tom and John Kiradjieff, immigrants to Cincinnati from Macedonia, opened a small food stand next to the Empress Burlesque Theater. They perfected a meat sauce, using spices such as paprika and allspice which were common in their homeland, to be served over hot dogs and spaghetti. In 1949, a former employee of Empress Chili, Nicholas Lambrinides, opened his own restaurant, naming it Skyline Chili because of the location’s panoramic view of downtown Cincinnati. A second location was opened in 1953, and in the 1960s the business expanded significantly expanded with locations across the city and surrounding region. In 1963, four brothers who emigrated from Jordan to Cincinnati bought a small lunch counter business called Hamburger Heaven, which served burgers, chili, and breakfast. Observing that chili was outselling other menu items, the brothers perfected their own recipe and changed the name to Gold Star Chili. This location grew into another thriving chain of Cincinnati-based chili restaurants. Other members of these families and former employees went out on their own to start their own independent chili restaurants, and chili took over the city. Finding chili in Cincinnati is like trying to find barbeque in Memphis. One study indicates that 80% of the population of Cincinnati eats chili once a week. It’s estimated this consumption totals about 2 million pounds a year. 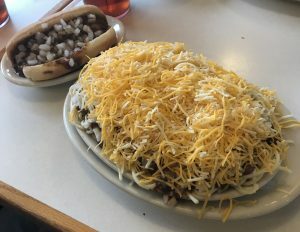 Cincinnatians have definite and strong opinions about which chili is the best, but they all agree that chili is as much a source of the city’s identity as Fountain Square or the Cincinnati Reds. For natives of the city who have moved across the country, the best they can do to get a taste of home is to make it themselves, order online, or buy a can from their local grocery. 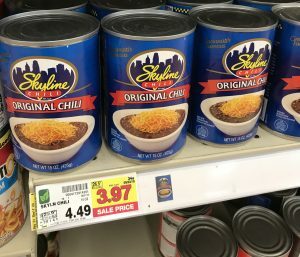 At the Kroger store nearest my home here in metro Atlanta, a can of Skyline Chili sells for $3.97, while the leading canned chili brand in the United States, Hormel, is priced at $1.49. Such pricing may seem completely illogical to some. Other than the mix of spices, the ingredients are largely the same. For a transplanted Cincinnatian, however, a can of Skyline Chili is a memory-laden tie to a hometown. There’s no concern that the production cost of the chili in that can may be about the same as Hormel. 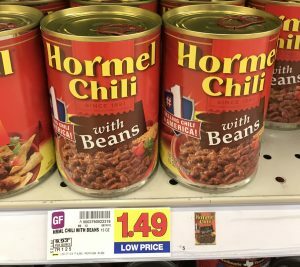 A can of Hormel Chili is just a cheap meal from a corporate food conglomerate. Emotions are an overlooked variable in the buying and renewal decision. Commercial psychologist Phillip Adcock observes that emotional reactions are 3,000 times quicker than rational thought. Moreover, he notes, emotion is 24 times more persuasive than reason. Business owners, steeped in the features and benefits of their own product or service, often don’t factor in the emotions which influence the buying and renewal decisions of their customers. Such is particularly the case for professional services, as those of us who provide those services expect that decision on logical considerations like our experience and expertise. This thought hit me recently as I sat across the table from a financial advisor as she detailed her knowledge and explained the work she puts into developing financial plans for her clients. It was all very sound, but what struck me most about my time with her was her cell phone. Sitting on the table next to her legal pad and pen, her phone screen was a spider web of cracks and the case was clearly battered. To be fair, she could have just dropped it that morning and not had the chance to get it fixed. Maybe she was a cheapskate when it comes to phones. Maybe she’d misplaced her phone and borrowed someone else’s for that morning. The problem, though, is that the emotion stirred in others by the sight of this phone, as they consider who to entrust with decisions on their financial future, contradicts the professionalism this financial advisor was trying to convey. So what emotions are stirred by your products or services? What risks are clients trying to avoid? What emotional ties do your customers have to you, as the entrepreneur, and to your services? What are the unsaid reasons they do business with you? Diagnosing and grasping the answers to these questions is essential if you want to fetch Skyline Chili prices.